--We are a small, locally owned neighborhood shop in the old European tradition. --Please stop in and see our shop at 7330 NE Bothell Way, Kenmore, WA, on the second floor of the Schnitzelbank Bavarian Chalet (formerly a German restaurant), above Snapdoodle Toys. --There are five dedicated free parking spots, and you are welcome to use the elevator (inside the big brown door), or the stairs on the side of the building. -- We are in our 10th year at this location and our 26th year in the violin business. 22 years in Seattle! --We are happy to offer free pickup/delivery in our company van (School districts in nearby areas; Kenmore, Bothell). 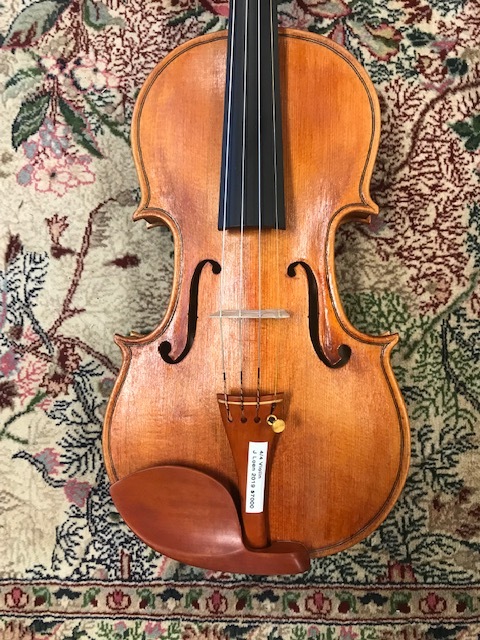 We specialize in violin, viola, cello, bass, their bows, and accessories, and we occasionally buy used instruments of good quality and condition. We do not sell or repair fretted string instruments, or brass & woodwinds (although we dabble in mandolins and concertinas). Please Note that we are unable to answer the phone if we are helping another customer at the counter, or if we are working on a delicate operation such as gluing or varnishing. This happens a lot, and that’s why we have Voice Mail. Please leave a message and if possible we will pick up, or we will call you back. Thanks for understanding that we run a very busy shop. We would like to thank the many customers who have written kind letters regarding our services. This means a lot to us. We will do anything we can for our loyal customers! The first instrument repaired, early in 1993, was a full-size cello presented by a member of our church, in Butte, MT. It needed a full setup, fingerboard planning, pegs, bridge, post, strings… normally costing hundreds of dollars in a shop (the family was not in a position to pay that much). I remember studying the literature to be able to do a proper job, then buying hundreds of dollars worth of tools and supplies. The repair was difficult and challenging, but I completed it and then demonstrated the cello by playing a simple hymn in church. We make Violins and Violas! Many thanks to Randal, who bought our new handmade Strad 1704 “Betts” copy violin, and a vintage Thomas Perry Dublin violin! Many thanks to Kris, who bought our new handmade Strad 1715 “Cremonese” copy violin! Thanks to Matthew, who bought our new handmade Brothers Amati 1615 copy viola! Other shops are staffed with highly trained sales people who want to talk to you about your next purchase (if you don’t have one in mind they will recommend several). We’re sorry, but we have no training in sales, so we are a little clumsy in that department. Our training and experience is in scientific research and lutherie, so we have fun combining the two! Our research horsepower is aimed at understanding acoustics, materials, and technical aspects of violin making. We also compile important data that can lead to making better sounding instruments. Lutherie is the craft of making and repairing stringed musical instruments. We have additional training in bow rehair and repair, finish retouching, varnishing, and other special topics. As far as we know, we are the only storefront violin shop in Puget Sound that actually makes violins and violas (maybe cello soon)! We are happy to show you our instruments in progress. In 1998 we started a research project painstakingly mapping details of hundreds of great old European instruments (including over 100 Stradivaris, 55 Guarneris, and over 100 other makers); the result is 17.1 gigabytes of data (550 feet of books on a shelf), summarized in a 227-page book that has been sold around the world. We learned a lot from doing this, and our work is internationally known because we shared what we learned. So, we can answer your questions about violins, in fact we will probably talk your ear off about what the old Italian makers did in the 16th and 17th Centuries. But we won’t suggest that you make a purchase unless you request it. All of your sound comes from your bow, so in our opinion it is the worst place to try to save money. Nevertheless, we get many requests for cheap bows, and we stock basic bows that are under $100 (keep in mind that a rehair is $70, so it is a bit strange that some bows sell for less than $70; think cheap Chinese labor done in a big hurry without regard for quality). The big thing about bows is the stiffness of the stick. Bow blanks are ranked and priced according to stiffness and very stiff wood blanks suitable for advanced bow making cost hundreds of dollars. Traditional bow wood (called “pernambuco”) comes from a small area in Brazil, and lately prices have risen because the supply is controlled (get these while you can, they will always be the world’s best bows). However, cheap wood for a $70 bow comes from China, and the stick is machine routed rather than handmade. That can be OK, but the big problem is that stiffness of natural materials follows a bell-shaped curve. The few bows on the high end of the stiffness curve are superior, and several in the middle are average. But about half of the bows on the low end of the bell-shaped curve are likely to warp, break, or loose camber because of poor wood quality (low density). You can’t tell the difference visually, although a good player or luthier can tell you almost instantly. -Don’t buy bows online. Try bows prior to purchase. Remember the bell curve; you have a 50% chance of getting a loser if you buy randomly. -Deal with a reputable brick-and-mortar specialist violin shop that values quality, guarantees their products, and accepts trade-ins if the bow doesn’t end up working for you. -If money is limited, get a carbon fiber (CF) bow rather than a cheap wood bow. The CF sticks are engineered to the correct stiffness, so you have avoided the biggest problem with low-price bows. They don’t cost much more and they will never warp or lose camber. There are two types; composite and woven (braided). I see fewer problems with the woven CF bows. We like USA-made CF bows better than Chinese products (we rehair hundreds of bows yearly, so we see how they are crafted). We talk a lot about “properly made instruments” as a factor in students’ success. What do we mean by that? We mean correct materials, craft, and setup, as has been clearly defined for over 500 years. In contrast, cheap instruments use inferior materials, are often machine routed, and have bad strings, pegs, and tailpiece. You can tell bad materials because they are weak; when you tune one string all the others go flat. Bad materials include fingerboards and pegs that are painted black to look like ebony. Poor craft (as done by routing machines) leaves parts too thick, which causes them to resist vibration or vibrate at higher frequencies than desired, leading to a screechy instrument. Bad setup guarantees that you can’t tune the strings, that strings will slip, and that the instrument won’t play correctly or sound good. All of this is unacceptable! The logical response to an improperly made instrument is to quit playing. And that player will conclude that they just had a typical (bad) experience with the violin (viola, cello, bass), even though that is an incorrect conclusion. So we think that quality is important with regard to student instruments. That’s why we don’t sell those poor cheap fiddles, and we are reluctant to work on them. A study was done of musicians and longevity, based on 8755 players, conductors, and composers. Long livers were conductors, cellists, and violinists (violists and bassists were not listed), and women lived longer than men. Rock musicians, singer-songwriters, guitarists, and jazz musicians had the shortest lifespan. Professional classical musicians also retained cognitive abilities longer. Overall, the demanding performances associated with the life of classical musicians and conductors seem to be a good thing for them. Rocking out, not so much. It takes some time to learn an instrument. The first five years are the worst. Play the Size that Fits You! We see a lot of young players, some successful and some not. I think that there are four factors that determine a young person’s musical success: personal motivation, parental support, equipment quality, and teaching quality. All are essential; students quit if one is missing. Efforts should be made to maximize these factors! A common equipment-related problem is that a student is given an instrument that is the wrong size (often too big). For example a student who fits a ½ or ¾ size violin is given a 4/4 violin. The player might like the idea that they are playing a louder instrument meant for an older player, but they are forced to modify proper technique in order to handle an instrument designed for a larger person. Consequently, playing is painful and sound is poor. Joint configurations do not enable comfortable and efficient bowing geometry. Progress is stalled because energy is spent straining to overcome ergonomic issues (arms are too short) for which the only solution is time. We usually see these “mis-fit” players only once, because they soon quit out of frustration. Sadly, this can be avoided. They might have been successful if they were given equipment that fit their bodies. Some of the best teachers even recommend playing a smaller size for longer than necessary. Facility is greater. Pain vanishes. You learn new methods like shifting without problems. It works! But playing a huge instrument never ends any better than when a child tries to ride an adult’s bicycle. Sure, they can do it, kids are agile, but …badly and for only a short time before they crash. We are happy to measure arm length to inform you about proper instrument size. We favor the Viometer, a plastic gauge with instrument sizes marked on the side. You simply hold it like a violin, pull out shaft to the middle of palm, and read off size (if borderline, defer to smaller size). Cello is sized a bit differently, but we can offer an opinion on that too. How Long Do Violin/Viola/Cello/Bass Strings Last? They can last a lifetime before they break, but they lose their best sound within a few months, maybe up to one year. People bring in 80 year old instruments with intact strings--so don’t wait until they break to replace them. We don’t wait for our car’s tires to pop before we replace them either; we judge them by their age, condition, and performance. Busy players putting in a lot of hours, or those who play a lot of loud, bombastic pieces, will need to change strings sooner. Professionals change strings before important gigs. But give the strings a few days to stretch and stabilize. What better way to entertain yourself than to learn to play an instrument? Our research on classic instruments is internationally known. We produced color contour thickness maps for a poster and article on Joshua Bell’s $4 million Golden Age Stradivarius violin for The Strad, an elite violin magazine from London, England. The maps show how top and back thicknesses pinch and swell (thickness in millimeters). The Gibson is one of the greatest violins in the world. Violin maker and author Sam Zygmuntowicz asked us to make thickness graduation maps of the top and back of the Gibson for a full-size poster that also shows photos, CT scans, and other data. This violin is an important example of Stradivari’s Golden Age, and has an interesting 20th Century history of loss and recovery. The article and poster appear in the November 2013 issue of The Strad. We previously wrote two articles for The Strad on Stradivari’s and Guarneri del Gesu’s wood and thickness graduations. A huge amount of our time, energy, and resources goes into providing and maintaining quality rentals for students. About half of customer visits (300-400 people/year) to the shop involve rentals. You might think that such a rental program would be a profitable venture, but 100% of after tax income from the rental program goes to pay overhead costs. Plus, we see it as a valuable neighborhood service to help develop the new crop of talented string players. If you have ever run a small business you understand that paying bills is the first priority in the rough and tumble game of staying afloat. Costs are high (thousands of dollars/month) to run a large shop with a big inventory. Money from rentals goes to the building owner, suppliers, shippers, insurance companies, utility providers, communications companies, credit card processors, equipment makers, accountants, Federal, State, and local government tax collectors, and dozens of other entities. This operation, like many small businesses, helps to power the local economy but please note that the owner does not profit from this rental enterprise! In some cases, we decline to offer rentals because overhead bills are fulfilled, or we are low on inventory. Please understand that supplies are limited. -Trade-in value makes it possible to advance as you grow or as your skills improve. For upgrade in size or quality of same instrument, bow, or case; equipment must be kept in same condition as purchased for full value; no damage (cracks, scratches, dents) beyond ordinary wear. Refurb fee applies. We reserve the right to decline upgrades or trade-ins in cases of what we judge to be excessive wear or damage.